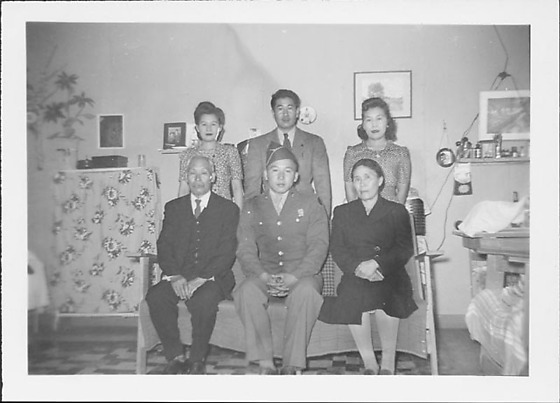 Family portrait of a man in United States Army dress uniform sitting on couch with older couple with two women and a man standing directly behind them in a barracks at Rohwer concentration camp, Rohwer, Arkansas, 1942-1945. Dressed in darker jacket over light colored shirt and necktie, slacks and garrison cap, the soldier sits between the older man in a dark suit and necktie and older woman in a dark coat; a marksman badge is pinned to his proper left breast. Two women in patterned dresses flank a man in a suit and necktie in back row. Various furniture items against wall in background, including cloth covered shelves, framed pictures. Same soldier as in 97.292.3L.